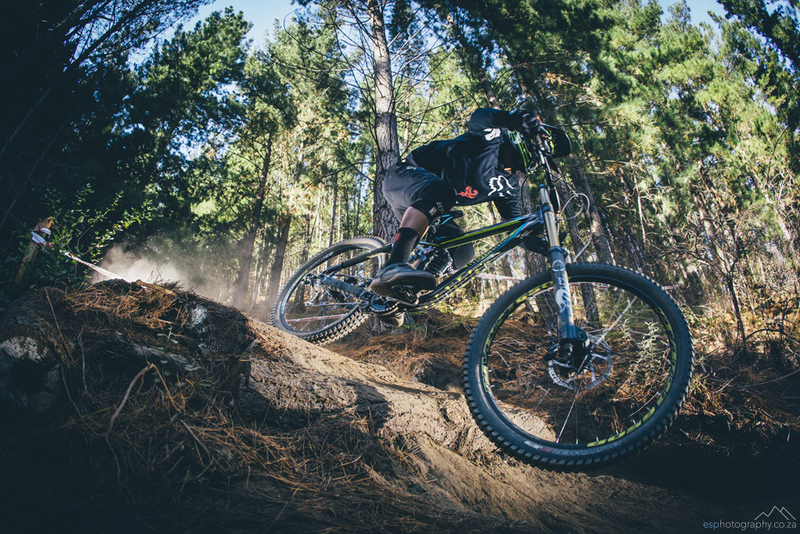 The evergreen Johann ‘Pottie’ Potgieter won the third event in the 2016 Western Province Downhill series held at Cascade Country Manor in Paarl, on Sunday, 10 April, in a time of 02:03.643. The three-time South African National Downhill Mountain Bike Champion edged out Theo Erlangsen, ( 02:09.785 ) and Adi Van Der Merwe ( 02:12.118 ). With the likes of Stefan Garlicki and Andrew Neethling absent due to their European World Cup campaigns, the field was wide open and Pottie, ever the wily old pro, took full advantage. The track at Cascades Manor is steep and physical and ran fast on an unseasonably hot (35-degrees) April Sunday. It features a hardpack surface but has a loose top layer of marble-sized stones which resulted in quite a few crashes. “You do have to keep concentrating the whole time because it’s so slippery. But, it’s a really fun course - there is always something happening," said Pottie. “The finals came and I hit all the corners sweet and pedalled hard where it counted and took two seconds off my seeding time which was enough for the win,” he said. “I’m really happy with how the day went. Thanks to Western Province Downhill and to all my sponsors; Mongoose, Omnico, Dragon Energy, Von Zipper, Seattle Coffee Company, Skull Candy and Fox Head South Africa – for making it possible for me,” he said. Aside from being on the top step of the podium, Pottie – who is known as a true character in the downhill community – thoroughly enjoyed the vibe at the Western Province DH event. “I haven’t done a provincial in a very long time, so it was really cool to see all the people and talk a bit of nonsense and socialise and stuff,” he said.